Pinot Days San Francisco: Report from the Front Lines Resurgence at Foppiano Vineyards Gary Farrell Vineyards & Winery: Embracing the Legacy Tasting the 08s at C. Donatiello Winery Churchill Cellars: A Piece of Pinot Heaven Pali Wine Co.: Manages an Ambitiously Diverse Portfolio Benziger: Proudly Devoted to Biodynamic Winegrowing Carr Vineyards & Winery: The Latest Releases Small Sips of Pinot Pinot Briefs Did You Catch That License Plate? 18th Annual Catalan Festival at Gloria Ferrer Caves & Vineyards This celebration on July 24-25, 2010, honors the winery’s Spanish roots and the opening of the winery in July 1986. The colorful Festival features authentic Catalan and Spanish dishes such as paella from many of the Bay Area’s best restaurants. Gloria Ferrar’s sparklers and still wines are featured as well, along with some of the Ferrer family’s collection of Spanish wines. Tickets are $50. RSVP online at www.gloriaferrer.com. Direct-to-Consumer Wine Shipments With America’s 6,700 wineries and media focused on House Resolution H.R. 5034, a study by the Ship Compliant of Colorado and Wines & Vines Industry Database found that 2.6 million cases were shipped direct-to-consumer for the year ending in March, or about 1% of the total annual U.S. wine sales of 251 million 9-liter cases. These cases represent a tiny portion of wine sales, but account for a significant percentage of smaller winery revenues. Napa Valley wineries sell more direct-to-consumer wine than any other U.S. wine region. U.S. wineries create 1.1 million jobs in American and have a $162 billion economic impact on the American economy. For more information, contact www.wineinstitute.org. Hugh Chapelle Moves to Quivira Vineyards Noted Sonoma County winemaker Hugh Chapelle, who has over 20 years of winemaking experience, was named winemaker for Quivera Vineyards & Winery beginning July 1, 2010. Chapelle had been the winemaker at Lynmar Estate in the Russian River Valley since 2004 and before that, was winemaker at Flowers Vineyard & Winery on the Sonoma Coast. Chapelle replaced Steven Canter, who took a winery position in Oregon. Quivera specializes in Rhone varieties, Zinfandel and Sauvignon Blanc. 2010 Dietary Guidelines May Redefine “Moderate” Alcohol Consumption The U.S. government is currently considering a redefinition of moderate alcohol consumption. A report released June 15 indicated a suggestion to define moderation as an average daily intake of up to one drink for women and two for men, with no more than three drinks for women on a single day and four for men. The wording, “Average daily intake,” is an attempt to clarify the results of many epidemiological studies that may report data tallied by drinks per week so that an average of one drink a day could mean the person had no drinks on any day except Saturday when they imbibed seven. The Guidelines want to clarify the responsible daily use of alcohol. The final Guidelines will be published at the end of the year. Surprising Report at Oregon Wine Marketing and Sales Conference Chriss Oggenfuss of Oggenfuss Wine Marketing in Napa reported that 78% of consumers trust other consumers’ comments the most. He said the top 20 wine bloggers have a larger audience and more influence than Wine Spectator. All the speakers’ Power Point presentations from the Conference are posted at www.rvwinegrowers.org. Carlton’s Walk in the ParkThis annual event is to be held July 31-August 1, 2010 at Wennerberg Park in Carlton, Oregon. A benefit for local charities, this festive event combines artists and musicians with outstanding Yamhill Countuy restaurants and wineries. Well-known Yamhill-Carlton wineries pouring include Anne Amie, Belle Bente, Carlton Winemaker’s Studio, Elk Cove Vineyards, The Four Graces, Ken Wright Cellars, Penner-Ash, Scott Paul Wines, Solena Cellars, Soter Vineyard, and Stag Hollow Wines. A beer garden is provided by McMenamins. Tickets are $15. Visit www.CarltonsWalkinthePark.com for information. International Pinot Noir CelebrationThere are still a few tickets available for this storied event in McMinnville, Oregon. $975 (full weekend), $150 (Salmon Bake), $125 (Sparkling Finale Brunch). A three-day party for Pinot lovers. Kudos to Gary Farrell Farrell recently sent out a letter to his mailing list stating what we have known for some time, namely, that people are resisting spending “more than is necessary” for quality wine. Sales of the most expensive luxury wines have slowed dramatically. Farrell believes, “This is a healthy correction in our industry,” and goes on to say, “As talented winemakers and growers partnered to produce highly acclaimed wines, it seemed there was no limit to what consumers would pay. Thankfully this trend is behind us, as we see top producers wisely reacting to current market conditions by resetting prices to more reasonable and sustainable levels.” Farrell predicts that for the first time in nearly a decade, there will be reduced demand and lower prices for grapes from even the finest and most coveted vineyards. Accordingly, Farrell reset the price of his Alysian 2007 Russian River Valley Selection Pinot Noir to $40 a bottle. For those that had already purchased this wine at the higher release price, he offered to provide a credit to one’s account or send a refund check. I believe this is a move in the right direction and will endear him to his customers, although I would have set the price even lower, feeling that the consumer would be more inclined to by the wine at $35. Joel Aiken Leaves Beaulieu Vineyard Aiken retired as vice president of winemaking at Beaulieu Vineyard this January after 27 years at the winery to devote himself to his own label, Aiken. He plans to specialize in Howell Mountain Cabernet Sauvignon and Sonoma Mountain Pinot Noir. He will continue to consult for Beaulieu’s Gerges de Latour Private Reserve Cabernet Sauvignon. Kai Schoenhals Diamond Lil Schoenhals left movie production to design and build restaurants, bars and hotels in 2000, often using landmark buildings to revive neighborhoods. 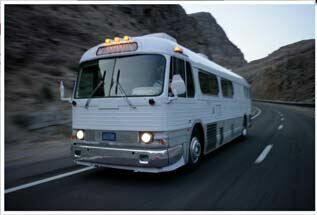 He and a partner have retrofitted a 1957 Greyhound bus with a kitchen and seating for 16. This summer, he is transporting the table to the farm. With Schoenhals as on board sommelier, the bus and its guests travel Sonoma County to pick up supplies for that night’s dinner, often asking the guests where they want to go. Then parked in a vineyard destination, diners enjoy a gourmet dinner with local ingredients and wines. Check it out at www.impakd.com. The Final Word I often get asked about the quality of recent vintages for Pinot Noir in California and Oregon. I dislike generalizations about vintages, but in response to these inquiries, I offer the following in the simplest of terms. Buy the 2007 vintage from California. Buy the 2008 vintage from Oregon. 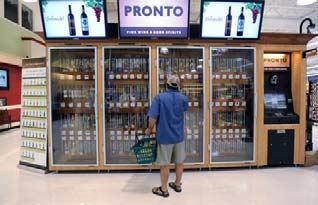 Wine Vending Machine Pennsylvania now has wine bottle vending machines in two grocery stores as part of a pilot program. An ATM-type device sits at one end. The customer chooses a wine, swipes their ID, blows into a breathalyzer and looks into a camera. A state employee in Harrisburg remotely approves the sale after verifying that the buyer matches the photo ID. The wine kiosks are closed on Sunday and holidays. This seems like a daunting and unglamorous way to buy wine. Only in Pennsylvania! Wine Wednesday Goes Awry. Another very funny piece of writing from the Bruliam Wines blog: www.bruliamwines.com/2010/07/wine-wednesday-goes-awry/. Sonoma-Cutrer Opens Tasting Room For the first time, Sonoma-Cutrer Winery in Windsor, Sonoma County, opened its doors to the public, featuring a newly renovated tasting room and offering tours of its winery. The tasting center will be open Thursday-Monday ($10) and tours with tasting ($25) will be offered by appointment. Sonoma-Cutrer is best known for its consistently fine Chardonnays and is the number one choice in restaurants by the wine buying public. The winery also produces a very credible Pinot Noir. Visit www.sonomacutrer.com. WineWeb Mobile Winery Tour Planning Tool WineWeb.com has released a mobile version of its winery tour planning tool, with support for iPhone, iPad and Android devices. The planner includes optimized tour routes and driving directions plus appointment scheduling and winery research tools. There is a directory of over 35,000 wineries covering every wine region in the world. The winery tour planning tool is available at wwwm.WineWeb.com. Bien Nacido Vineyard of the Year 2010 At the recent VIP awards ceremony at this year’s California State Fair, Bien Nacido was given the “California Vineyard of the Year” award as a vineyard that has consistently over several growing seasons produced grapes that have contributed directly to wine of superior quality and marketability within commercial sales systems and among fine wine judging. Visit www.biennacidovineyards.com. Did You Catch That License Plate?